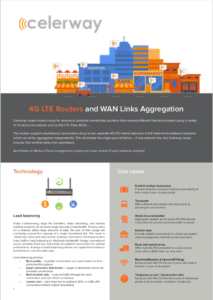 The Celerway Fractus is a 4G LTE Router with WAN Link Aggregation, providing intelligent load balancing. It can support up to 7 VPN Tunnels, has 5 Ethernet ports, 1 SIM card slot, and it provides dual-band Wifi and GPS. 4G connectors are 2 x SMA Female. The Celerway Fractus router provides load-balancing throughput from 750 to 950 Mbit/s. The router supports up to 7 VPN tunnels, and a single VPN tunnel can reach throughput of 40 to 100 Mbit/s. 12 IPSec tunnels can run in parallel at 10 Mbits/s per tunnel. The Fractus has 5 ethernet ports that can all be used as either WAN or LAN. Dual band WiFi and GPS are available.